Awesome ending to the summer! Marshfield is an archeologically diverse beach town within an hour's drive of both the magic of Cape Cod to the south and the culture of Boston to the north. History buffs will enjoy being close to the rich significance of Boston's Freedom Trail and the town of Plymouth, which offers a summer-running ferry to Provincetown. 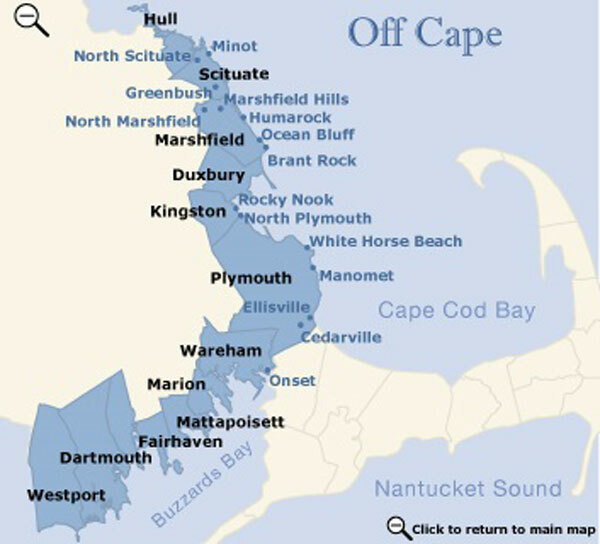 Referred to as "The Town of Villages," Marshfield has eight villages in all: Marshfield Center, Marshfield Hills, North Marshfield., Rexhame, Fieldston, Ocean Bluff, Brant Rock, and Green Harbor. Five of these villages have been graced with approximately 5 miles of mostly sandy public beaches (nine total beaches in all, some dog-friendly) and each holds its own beauty and charm. The most popular of Marshfield's beaches are Rexhame Beach, Green Harbor Beach and Ocean Bluff. Take up a round of golf at Marshfield Country Club or Green Harbor Golf Club, both 18-hole courses. Or visit Marshfield in mid-late summer for the highly anticipated Marshfield State Fair, one of the oldest agricultural fairs in America. Nature lovers will revel in exploring the Daniel Webster Wildlife Sanctuary (along Green Harbor River) and the North River Wildlife Sanctuary (along Route 3A), both Audubon affiliated sanctuaries. Or take a leisurely stroll through the gardens of the Veteran's War Memorial at the intersection of Route 3A and Route 139 toward Scituate.